World 6- Castle is the thirteenth course of World 6 in Puzzle & Dragons: Super Mario Bros. Edition. 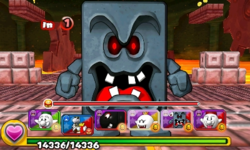 It is a castle level with enemies consisting of Chain Chomps, Bony Beetles, a Big Thwomp, a Big Bony Beetle, a Big Whomp and a boss fight with Roy Koopa. This level is straightforward, consisting of six battles (the sixth battle having a Big Whomp) and Roy Koopa for the boss fight (if the player already has Roy as an ally by clearing ★World 6- , they fight Double Lakitu instead). 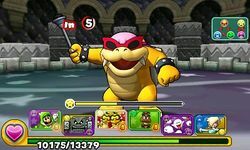 Roy Koopa has an extremely high amount of defense: to defeat him, the player must either create a large Combo attack to penetrate his defenses or bring an ally whose Skill allows them to lower the defense of enemies (such as a Bullet Bill's). Roy, the boss of World 6- Castle. ★World 6- Castle is a difficult version of World 6- Castle from ★World 6. The Orb configuration for this Special World course matches that of its normal world counterpart. 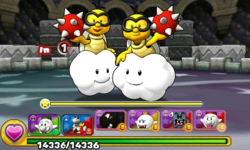 "Double Lakitu", replacing Roy as the boss of World 6- Castle.